Difference in winter surface climate for solar minimum minus solar maximum. The impact of solar irradiance variations on Earth’s surface climate has been debated by many in the past. Based on correlations between solar variability and meteorological changes, the Sun-climate link seems obvious but, as is often stated, correlation does not prove causation. Previously, any link was disputed because the amount of energy delivered by the Sun was deemed too small to have a significant impact. New satellite measurements indicate that variations in solar ultraviolet irradiance may be larger than previously thought, forcing a reevaluation of the impact of solar variation. A recent report in the journal Nature Geoscience claims to show just that—a link between the 11 year solar cycle and Northern Hemisphere winters. Using older measurements of solar variability over the 11 year solar cycle as input, climate models have proven incapable of establishing linkage between insolation and climate. Still, there have been tantalizing reports of such linkage in the past (see “The Sun's Hidden Power”). In a report in the August 28, 2009, issue of the journal Science entitled “Amplifying the Pacific Climate System Response to a Small 11-Year Solar Cycle Forcing,” Gerald A. Meehl et al. described a possible mechanism that could explain how seemingly small changes in solar output can have a big impact on Earth's climate. Their work explained how the upper atmosphere can act as a solar heat amplifier when UV radiation from the Sun increases. Now, new, more accurate measurements taken by satellites have revised the amount of variability in insolation, particularly in the ultraviolet frequencies. In “Solar forcing of winter climate variability in the Northern Hemisphere,” Sarah Ineson et al. have applied these new data to a revised climate model and report positive linkage between insolation variability and climate. The researchers explain the importance of the new satellite data. Lockwood, M., Harrison, R.G., Woolings, T. and Solanki, S.K. 2010. Are cold winters in Europe associated with low solar activity? Environmental Research Letters 5: 10.1088/1748-9326/5/2/024001. 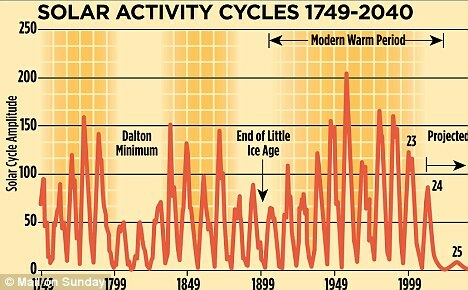 Noting that "solar activity during the current sunspot minimum has fallen to levels unknown since the start of the 20th century," and that "the Maunder minimum (about 1650-1700) was a prolonged episode of low solar activity which coincided with more severe winters in the United Kingdom and continental Europe," the authors write that "motivated by recent relatively cold winters in the UK," they investigated the possible connection between these severe winters and low solar activity, identifying "regionally anomalous cold winters by detrending the Central England temperature record using reconstructions of the northern hemisphere mean temperature." Lockwood et al. discovered that "cold winter excursions from the hemispheric trend" do indeed "occur more commonly in the UK during low solar activity, consistent with the solar influence on the occurrence of persistent blocking events in the eastern Atlantic," and they state that "colder UK winters (relative to the longer-term trend) can therefore be associated with lower open solar flux (and hence with lower solar irradiance and higher cosmic ray flux)." 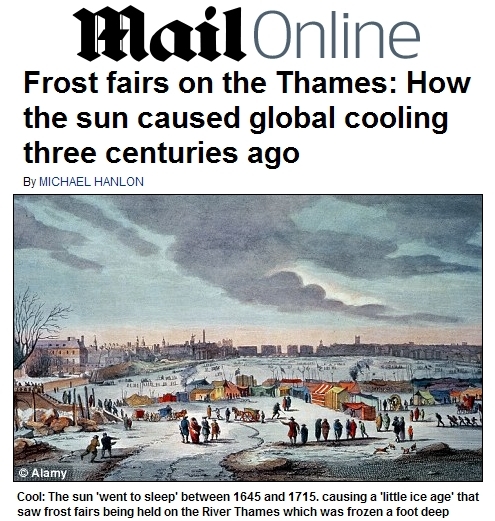 They are quick to note, however, that "this is a regional and seasonal effect relating to European winters and not a global effect." Increased international interest in the SIM 'wobble effect' began after Australian scientist Dr. Richard Mackey published a paper addressing the effects of the barycenter shift in The Journal of Coastal Research in 2007. Mackey drew inspiration from the work of the late Rhodes Fairbridge.